This afternoon Kim and I went for a hike at Pinnacles National Monument. I brought along my camera in the hopes of getting a glimpse at the Condors that roost there. 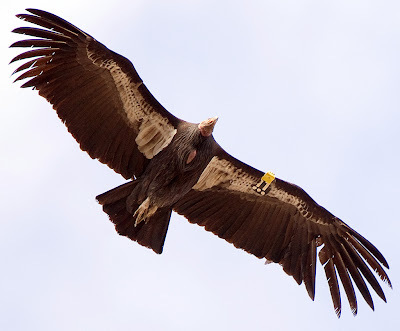 Right near high peaks we spotted a couple of the Condors flying around. I took a series of shots but this was the only one that turned out. Technical Specs: Canon 1D3, 300mm f/2.8 + 2x TC (600mm equiv. ), f/5.6, 1/320s, ISO 640.